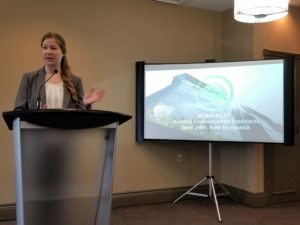 This week BOMA Canada and NB Power presented in New Brunswick and PEI to showcase how easy it is for businesses to reduce the impact they have on the environment and explain that simple changes can have dramatic results. Buildings in North America consume 50% of our natural resources and account for 1/3 of our energy use. They also contribute to 25% of landfill waste, and 35% of greenhouse gas emissions. For many, sustainability is always on the agenda, but there is never a sense of urgency attached to it. In our busy lives, it seems there’s always a more pressing matter to attend to, and efforts to make the workplace sustainable often unintentionally get pushed aside for more urgent tasks. BOMA makes it easy for building owners to celebrate and share their achievements by providing marketing materials that raise awareness and encourage other buildings to get certified, too. Commercial Properties Limited is proud to own eight BOMA BEST certified buildings and we are working on adding even more to that list. 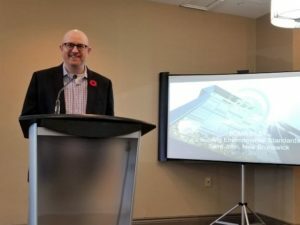 For New Brunswick businesses, NB Power makes it even easier for buildings to get certified by offering rebates on the cost of the energy audit required by BOMA BEST certification and on the cost of implementing the energy efficiency measures recommended by the audit. If you’re not a building owner, but you still want to make your workplace more sustainable, the BOMA Sustainable Workplaces program can help. Each workplace chooses how they want to work towards sustainability by setting and tracking goals specific to their environment. These goals can be as simple as ensuring everyone turns their monitors off at the end of each workday. The Sustainable Workplaces program is not about making dramatic changes, but simply ensuring your organization is continuously improving. The first step is beginning. Learn more about BOMA BEST and Sustainable Workplaces by contacting the local association, BOMA NB/PEI, or by downloading BOMA BEST Sustainable Workplaces Guide. To start your BOMA BEST certification now, click here. Special thanks to Sustainable Saint John, BOMA NB/PEI, and JaniKing for making the presentations in New Brunswick and PEI possible.